In light of the most recent events impacting USA Gymnastics, on behalf of the Region 7 Committee I wanted to provide you all with an update on the status of Region 7. Your elected Region 7 Committee of volunteers is united in our message of strength. Region 7 is STRONG! We are functioning (and able to function) under the assumption that all events scheduled or to be scheduled for the 2018/2019 season will run as planned (see message Annie Heffernon highlighted below). Now is the time to continue to show our strength and function with a business as usual approach. As your elected representatives of Region 7 – your Committee will continue to put the athletes, coaches, club owners, parents, and all associated with Region 7 as the top priority as we move forward! We will also continue to update you with any new information we receive in a timely manner. Please feel free to pass along my contact information on to anyone with any questions. I will be happy to address any concerns, to the best of my ability, that they might have. We look forward to incredible season of gymnastics and are excited to see it all come together at the invitational, State and Regional meets this year. I understand many of you are concerned about your state and regional funds. I spoke with Scott Shollenbarger, our CFO, this morning. He assured me that your funds are there and that you should continue to run your state and regional camps/clinics/events/competitions as you normally would. Any decision eventually made by the USOC will not impact state and regional funds. Also, the Junior Olympic National and East/West Championships and any other championship events will take place, as scheduled. Yesterday’s news from the United States Olympic Committee is both unsettling and upsetting, especially for athletes, coaches and club owners. We know you have questions and concerns about what this means for you, your athletes, your gym, your invitationals, your club members. USA Gymnastics is, and will continue, providing services and opportunities for our members. All sanctions, member benefits, policies and services are still in place. Existing event sanctions are still valid and new ones are being issued. The thousands of young gymnasts who are entered in invitationals this weekend, and in the coming weeks and months, will still have the opportunity to compete. All athlete and professional memberships and educational, judging and background check certifications are still valid, and member requirements and benefits in place. Member club memberships are still valid. Educational courses and programs are available online and as scheduled. Individual and club memberships are being processed and open to interested individuals and clubs. Each discipline will continue to plan and host its events and championships. USA Gymnastics and its staff continue to be here to assist and serve you, our members. We will continue to carry on the day-to-day operations and business of the organization. Our commitment to the gymnastics community and this sport is unwavering. To be clear, USA Gymnastics remains the recognized national governing body, including by the International Gymnastics Federation, unless or until the USOC process is concluded and a decision is made whether or not a change is necessary. We have athletes competing at the World Trampoline and Tumbling Championships this week, trampoline and tumbling’s World Age Group Competition next week, and the World Cup in Cottbus, Germany, later this month. We will keep you informed as we learn more information and details going forward. Please send us any questions you may have, and we will respond to those we can and work on getting answers for the rest. USA Gymnastics is the sum of all of its parts. Along with athletes, we are comprised of thousands of coaches, gym clubs and professional members who work every day to help athletes follow their dreams, whether it is learning to do a handstand or competing. The safety and interests of our athletes remain at the heart of our mission. While the athletes are the heart and soul, and our coaches, judges, administrators, meet directors and gym clubs the backbone of our organization and sport, the grassroots level is the bedrock and foundation for gymnastics. We are here for you and committed to serving our members. 1. Updated meet schedule reflecting the changes to the number of athletes in each age division/session. NO time or sessions changes were made at this time, only updates to numbers of athletes. 2 Updated rosters reflecting all scratches to date. Please review one more time for accuracy. 3. The starting event draw for each level. Please note: although it is not likely, this is subject to change. Toby Stark, the USA Gymnastics director of Safe Sport, did an informative presentation in the fall of 2017. Click here to view his presentation. 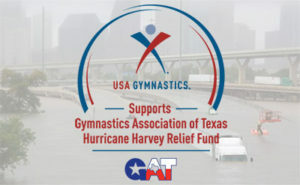 AUSTIN, Texas, Sept. 1, 2017 – USA Gymnastics supports the Gymnastics Association of Texas (GAT) Hurricane Harvey Relief Fund, which GAT established to help gym owners hit hard by Hurricane Harvey with their efforts to rebuild, refurbish, clean and recover. Many clubs are at or near a total loss. The fund will provide assistance not only for clubs in South and Southeast Texas, but also in Louisiana and other areas impacted by Hurricane Harvey. 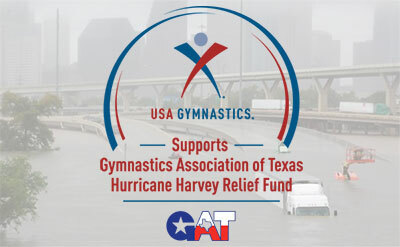 Donations to the GAT Hurricane Relief Fund may be made via the association’s website and/orFacebook page. GAT is a 501(c)(3) corporation. Information for gym clubs about how and where to apply and the process and the criteria for awarding assistance will be posted on the GAT website. The Gymnastics Association of Texas (GAT) exists to serve the gymnastics club owners, coaches and judges by providing the most up-to-date training, teaching, business and early childhood development practices available. Through an annual convention, GAT serves not only the great State of Texas, but also the entire United States by being a go-to source for everything gymnastics, both recreational and competitive. The J.O. Compulsory & Optional, and Xcel Code of Points replacement pages have been posted on USAGym. The Xcel Code of Points replacement pages can be accessed by by clicking here. Then click on Xcel Code of Points Revised Pages (posted 7/21/17). The J.O. Optionals Code of Points replacement pages can be found by clicking here. Then click on Revised Pages (posted 7/26/17). The J.O. Compulsory Code of Points replacement pages can be viewed here. Then click on Revised Pages (posted 7/26/17). You can also view the 2013-2021 JO Compulsory & Optional Flip Book replacement pages here. To help streamline the regional entry and payment process, Region 7 will be using Meet Maker this year. Instead of going through a State Committee Member, each club will be responsible for registering and making payment on their regional qualifiers. If you have any issues or questions about the process, please contact your appropriate State Committee Representative. As we are trying to clean up judging in WV, it has come to our attention that we are supposed to be collecting judge request forms as well as assigning fees for meets. This is detailed on page 28 of R&P. As for securing judges, we are down to 3 level 10 rated judges that can travel (4 if you’re meet is in Parkersburg). We are trying to utilize Ohio judges as much as possible, but are running into scheduling issues. If you have specific requests of other judges, please let me know. I will send you each an individual email with the confirmed judges so far for your meet. I’ll keep you posted! Thanks.